GENIE is a flexible framework for climate modelling that can be used to couple together different model components of varying complexity in order to provide an appropriate modelling tool for a wide range of possible applications. 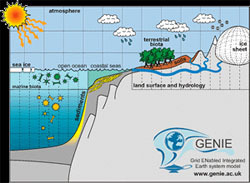 GENIE has modules that describe the ocean, the atmosphere, ocean biogeochemistry, marine sedimentary processes, weathering processes, terrestrial vegetation, sea-ice and ice-sheets. The results presented on this website derive from two different GENIE configurations, which we call GENIE-1 and GENIE-2. The principal difference between these two configurations is the complexity of the atmospheric model. The GENIE-1 configuration applied here couples together a low resolution intermediate complexity 3D ocean model (GOLDSTEIN), a highly simplified 2D energy-moisture balance atmosphere (EMBM) model, a simple model of sea-ice (which accounts for both thermodynamic and dynamic effects) and a minimum spatial model of terrestrial vegetation (ENTS). Although we include a vegetation module (as vegetation has a very significant effect on energy-moisture balance through, for instance, changes in albedo and "surface roughness"), other modules which relate to the carbon cycle (such as the ocean biogeochemistry module BIOGEM) are not included. These are not relevant for the work described here as we are analysing the greenhouse gas concentration profiles that are outputs of the Integrated Assessment Modelling. The results presented on this website are derived from emulators that have been derived from a collection of 480 GENIE-1 simulations. Each of these simulations produce plausible modern and glacial climates but have different input values for 25 key physical parameters in order to quantify model uncertainty. For a more detailed description of the ensemble design see Holden et al. 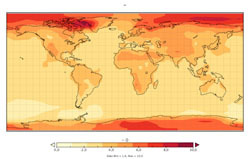 Climate Dynamics (2009). The ensemble has an average climate sensitivity (equilibrium temperature change at doubled CO2) of 3.8ºC. GENIE-1 is applied at an ocean resolution of 36x36x8. It simulates ~3,000 years of "real-time" in 1 CPU hour. The GENIE-2 configuration applied here also uses the ocean model GOLDSTEIN, but couples it to a 3D atmospheric model (IGCM), a highly simplified sea-ice model and a simplified land surface model (which does not model vegetation). The atmospheric model is substantially more complicated than in GENIE-1 and contains the same dynamics as full GCMs, albeit at lower resolution with a simplified representation of physical processes such as clouds. The use of a 3D atmosphere enables more robust estimates of changes at a regional level than is possible with GENIE-1, but is a very much more demanding calculation - GENIE-2 is approximately 250x slower than GENIE-1 in the configurations described here (GENIE-2 is itself orders of magnitude slower than the most complex GCMs). We also apply an ensemble methodology to build emulators of GENIE-2, though this ensemble is at an earlier stage of development than the GENIE-1 ensemble. The ensemble varies 19 key atmospheric and ocean parameters to generate 122 plausible modern climate states (with the single constraint that they are required to have a modern global average temperature of between 9.5 and 19.5°C). The climate sensitivity of this ensemble has not yet been calculated (10,000s CPU hours are require to run the simulations to equilibrium) but has been estimated from the "Transient Climate Response" to be 2.1°C. This is at the low end of the range of IPCC climate sensitivity (2.1 to 4.4°C). In order to correct for this bias and present a climate response that better reflects the consensus of IPCC models, we have scaled the spatial patterns generated with GENIE-2 to the global average warming predicted by GENIE-1. GENIE-2 is applied at a resolution of 64x32x8 (ocean) and T21 atmosphere with 7 vertical levels. It simulates ~12 years of "real-time" in 1 CPU hour. 1) "Forcing Uncertainty" (unknown future greenhouse gas and aerosol emission scenarios, land use change etc) which are the causes of climate change. This is by far the greatest source of uncertainty associated with future climate change. 2) Model "Parametric Uncertainty". Processes which occur on small spatial scales, such as the formation of clouds or ocean eddies, cannot be modelled in detail but are instead represented by parameterisations. These are relatively simple equations which are designed to reproduce the large-scale averaged effect of these processes. The coefficients (parameters) in these equations cannot always be derived from theory, and the precise values are hence not known, although theoretical understanding or empirical observations provides information on sensible parameter choices. Within this range of possible input, the range of possible model output which can arise is known as the parametric uncertainty. 3) Model "Structural Uncertainty". This arises as a result of shortcomings of the model and is very difficult to quantify as it is caused by process which are either not modelled or are poorly understood, so that the consequences of their effects are (almost by definition) not calculable. The total Parametric and Structural Uncertainty is known as "Model Uncertainty". The calculations described in this website address all three of sources of uncertainty by considering both model and forcing uncertainty. Based on: A probabilistic calibration of climate sensitivity and terrestrial carbon change in GENIE-1 Climate Dynamics, Holden PB, Edwards NR, Oliver KIC, Lenton TM and Wilkinson RD. This section describes a study to quantify the uncertainty in "Climate Sensitivity" that arises from model uncertainty. Climate sensitivity is defined as the equilibrium response to a doubling of atmospheric CO2. Although the forcing is well defined, the climate response to this forcing is very difficult to quantify precisely (and is the focus of much climate research) as it results from a myriad of complex and interconnected physical, chemical and biological feedback processes in the atmosphere, ocean, cryosphere and biosphere. An ensemble is a collection of simulations which vary unknown model inputs in order to provide a quantification of model uncertainty. Here we describe an ensemble of roughly 1,000 GENIE-1 simulations in each of three climate states. 1) Pre-industrial with forcing similar to today, except atmospheric CO2 concentration is fixed at 1850 levels of 280ppm. 2) Last Glacial Maximum (LGM), Ice-age conditions with CO2 concentration of 190 parts per million and with large areas of the globe covered in ice. 3) CO2 concentrations doubled from pre-industrial levels to 560ppm. Each of the 1,000 simulations applies a different set of values for 25 parameters. The ranges of these parameters were deliberately chosen to be wide in an attempt to encompass parametric uncertainty as much as possible. Furthermore, we do not require the model to accurately reproduce the modern climate state. We only require it to reproduce the general characteristics of the modern climate state (to illustrate, we require the presence of sea-ice off the coast of Antarctica). This is in contrast to the more usual approach of using a "tuned" model, whereby parameter values are chosen in order to reproduce the climate state as closely as possible. Our approach is designed to allow for model structural error. By accepting a wide range of both input parameters and output states, we allow parametric uncertainty to dominate over structural uncertainty to produce a wide range of model responses which cover the range of uncertain feedback strengths. We then apply a statistical approach known as "Bayesian calibration" to calculate probability weightings for each of the 1,000 parameter sets, based on how well each simulation reproduces observed LGM cooling. These probability weightings are then applied to the calculation of the climate response to elevated atmospheric CO2, providing a calibrated estimate for climate sensitivity and the associated uncertainty. The approach indicates that the climate sensitivity is most likely to be 3.5ºC, with a 90% probability that it will lie within the range 1.6 to 4.7ºC. This is similar to the range of IPCC estimates of climate sensitivity of 2.1 to 4.4ºC, derived from 19 state of the art GCMs (with an average of 3.2ºC). We do not consider only climate sensitivity, but also use the model to consider the possible responses of other important aspects of the Earth System, such as changes in sea ice and ocean circulation. In particular, we consider the response of vegetation to global warming and estimate a 37% probability that under doubled CO2, the terrestrial biosphere will stop absorbing CO2 but instead begin to emit additional CO2 due to increased plant respiration rates in a warmer world. A tool that has been applied for much of this work is emulation, whereby the output of the model is fitted to relatively very simple (and very fast) functional forms. The power of emulation is that it can be used to investigate large numbers of different model set-ups (e.g parameterisations or forcing scenarios). The emulation of the climate models is performed by fitting output variables to polynomial functions of input parameters. The building of the emulator proceeds by successively adding terms in an attempt to best describe the model output. In order to avoid over-fitting the data, a test known as the "Bayes Information Criteria" is applied each time a new term is added. This test favours an improved fit to the data, but penalises the addition of extra terms, and so attempts to find a minimum adequate model which best fits the data while minimising the number of terms in the emulator. To emulate GENIE-1, we have built 12 emulators which describe 3 outputs of the model (change in surface temperature, change in vegetative carbon, change in fractional vegetation cover) averaged over 4 large land masses (North America, South America, Northern Hemisphere Eurasia/Africa and Southern Hemisphere Asia/Africa/Australasia). To emulate GENIE-2, we have developed an approach to emulate 2D spatial fields of change. We have applied this to emulate fields of warming over the next century. The approach uses the technique of "Empirical Orthogonal Functions" (EOF). This technique breaks down a set of fields (here the different fields that are produced across an ensemble of simulations) into a set of 2D orthogonal fields which describe the principal patterns of spatial variability across the ensemble. Their primary purpose is to reduce the large number of variables that are required to describe a set of spatial fields, whilst retaining a full description of the variability of the spatial pattern. Typically the first 5 EOFs are sufficient to capture ~90% of simulated variability. The Principal Components (PCs) of each EOF define the sign and magnitude associated with that EOF in order to reproduce any given simulated field. i.e. once the EOFs have been derived, knowledge of only five numbers (the PCs) is sufficient to construct a good approximation to the simulated field. Just as the simulated field is a function of the model parameters, so are the PCs. As such, they can be emulated as a function of the model parameters. These emulators can then be used to construct an emulation of the field from any arbitrary choice of inputs. 4) Calculate the mean and standard deviation of these 122 fields which describe the emulated warming and the uncertainty in the prediction. 5) Scale the emulated warming according to give the same globally averaged warming as emulated by GENIE-1 for the same concentration pathway. This is done to correct for the bias that results from the fact that GENIE-2 has a climate sensitivity (~2.1ºC) which is at the lower end of the range of IPCC models (2.1 to 4.4ºC). The GENIE-1 ensemble has a climate sensitivity of 3.8ºC which is a better (though now slightly high) representation of the range of IPCC models. The climate forcing is expressed in terms of effective CO2. This is the equivalent amount of CO2 that would provide the same total forcing as the sum of all greenhouse gases (we consider CO2, CH4 and N2O and ozone), anthropogenic aerosols and, for historical forcing, solar variability, volcanic eruptions and land-use change. The concentration pathways for effective CO2 are separated into two periods, historical (1850-2005) and future (2005-2105). Both ensembles of simulations (GENIE-1 and GENIE-2) are "spun-up" to be in equilibrium at pre-industrial concentrations of CO2 of 280ppm. From these spun-up states, the simulations are allowed to change, firstly in response to historical emissions and then in response to different possible future emissions. It is necessary to include the historical forcing (1850-2005) as the present climate is not in equilibrium with current levels of atmospheric CO2. This is primarily because of the large "thermal inertia" of the ocean which means that the ocean does not warm fast enough to keep pace with the rate of greenhouse gas emissions. The historical forcing is derived from Nozawa et al (2005) which expresses the effects of each the above forcing components as a "radiative forcing". These are converted into an equivalent effective CO2 concentration (Radiative Forcing = 5.35 x ln (CO2e /280ppm) Wm-2). The output of TIAM is converted into an equivalent CO2 concentration profile. This profile can take any arbitrary path to reach any arbitrary level of CO2e in 2105.
where Co is the effective CO2 concentration in 2005 (=393 ppm), t is time and A1, A2 and A3 are the three coefficients, technically these are linear combinations of the first three classical Chebyshev coefficients. For completeness, it is worth noting that time is mapped onto the range (-1, 1) with -1 being 2005 and 1 being 2105 so that the value of A1 is equal to the total change in CO2e between 2005 and 2105. To build the ensembles and emulators of GENIE-1 and GENIE-2 we produce emissions scenarios by allowing these three coefficients to vary over ranges that cover likely future emissions scenarios. To investigate the consequences of an emissions scenario produced by TIAM, we solve for the three coefficients that best describe this pathway. These three coefficients then provide the necessary input for the GENIE emulators to calculate an estimate for the climate change (and associated uncertainty) that would arise from this TIAM scenario. In this project the GENIE model has been used to calculate the climate impact of different policies concerning world emissions of GHGs. In this project, a new statisical emulation method has been implemented to dynamically produce maps showing the SAT change (average and standard deviation) in different parts of the world.